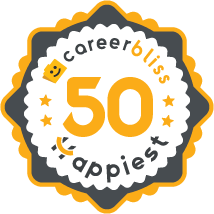 On average, employees at Humana give their company a 3.7 rating out of 5.0 - which is 3% lower than the average rating for all companies on CareerBliss. The happiest Humana employees are Sales Representatives submitting an average rating of 4.2 and Creative Developers with a rating of 3.3. "I have worked for Humana for a few years and have found that Humana has a lot to offer their employees. The employee "well-being" is a huge focus and they encourage and promote healthy physical and emotional choices for members and employees alike. There are lots of opportunities to get involved with volunteer activities and/or find support or groups of interests that involve something that you want to be involved with. There is opportunity to work from home if that is your desire. The in between and bad is they make it impossible for some to promote or transfer. If you are not in a "click" or the popular group or management isn't your friend, then forget it. And there are no raises for little people. I make the exact amount I was hired in at years ago. I was told that Humana does not give raises about a year ago. I was told different when hired. The really bad is that you know how much you are unappreciated everyday..."
"I've worked for this company for the last 7 years. Overall is a good company and has good principles and values but management is very far from the employees, we are not heard or taken into account when making decisions that affect us. No opportunities for promotion or development in this company." "I've been at Humana for more than 5 years and have always had terrific reviews... however, at Humana, it's not how you perform or contribute to the organization, it's who you know and how you kiss up. Very political organization. It has become more so since the Aetna acquisition announcement -- plus they expect you to drink the koolaid that they are handing out. The CEO will get $34 million when acquisition is complete. We'll get 2 weeks salary for every year. I tell ya... follow the money. If I had to do it over, I would not have joined the company nor stayed as long." "Humana as a whole is a nice company with right policies and flexibility defined for employees to do their best work. The only bad thing is whether these policies are being followed fairly or not are not been monitored. Depending on department you are working in, your experience for working with Humana can be either hell or heaven. In my experience our department was having an unfair manager who would like to favor employees who are a** kissers. If you are in his favorite list you will enjoy all the benefits: great flexibility of working hours, working at home, even if you don’t have proper degree or skills or even if you don’t work you can still get better rating than person who is hard working with all proper skills. Favoritism is root cause of killing good culture. Nobody likes to be treated unfairly. We cannot expect fair work ethics from employees who are being treated unfairly. My advice to top management: if any department has high turnover of employee rate or more unhappy employees, then try to monitor the reason of their unhappiness. If employee joins the team, learn and master the project, take the training and then leave to another department, then it is a huge loss to company. Not everyone likes to move department to department if they are happy. This is the best company I love to work for. Still, I will have to leave it because of a bad manager I cannot tolerate anymore." "Program Test Manager at Humana is responsible for the SIT of large programs across various releases. A typical test manager's role, the challenges are working with the sub areas/ application teams for their test plans, meeting the test data requirements and general lack of test environments. Add to that the usual running around for defect tracking and frequent change requests & undocumented requirements." "I have been working for this company from last 5 years. I have got awards for my performance in company. Currently I am on Project Lead roll." "I was at Humana for three weeks. I rocked my position, and I liked it despite the extremely high turn over rate. Contractors were being let go in record-blowing numbers. It seemed like every week we received emails that one or two contractors were let go and if they tried to gain access to their systems or into their building to contact security immediately, even though these contractors while working there served and posed no threat whatsoever while working there observed by their behaviors. They were extremely professional. I will say that whenever I asked for help I was immediately referred to the Knowledgebase articles and the Team Leads showed little interest in assisting me or others. Also, I seemed to be one of the only "oldest" contractors working their at their help desk because all of the other contractors were in their early 20's. We had a huge knowledgebase, very little help from Team Leads regarding protocol. They wanted you to find the information on your own, and if and when that was incorrect, they let you go. I was let go after only 3 weeks of employment and yet I was extremely good at providing professional, and courteous support. They receive only 1 star for a rating because If I could rate them a -1, I would. We're not robots and we shouldn't be ignored just because of our age, or the fact that were contractors. We're people, Humana. People. You treat your customers considerate, what if one day we are one of your customers?" "I have worked for Humana for 9 months and enjoy working with my coworkers and leader. Humana is one of the most compliant companies when it comes to laws and regulations. Makes me feel good that not only do they protect the company but also my career." "I have worked for iPay solutions." "I started with Humana in April, 2014. This is 30PB environment composing mainly of EMC storage, but also comprising of IBM DS8000 series arrays, along with Pure, Violin, IBM TM and XtremIO FLASH Arrays." "The company is not a bad place to work for. It can be very demanding at times, especially during peak season. Some business systems and decisions seem very archaic considering the profit the company turns." "I have worked for Humana inc. since 2013 to 2014." "I have worked for Humana for the past 8 years and I love working there. The pay is good, the people are great, and work environment is also great." "I really loved this job."